With an eclectic menu, a comfortable atmosphere and Winnebago’s first bar in more than 100 years, Toni’s of Winnebago stands out to locals and travelers alike. Join owner Michelle Princer as she reflects on the restaurant’s 20 years in business. Michelle Princer has tended to a garden her whole life. So when it comes to fresh, farm-to-table cuisine, she’s a natural at creating tasty, visually stunning dishes. She accomplished her goal in 1998 when she opened Toni’s of Winnebago, 508 N. Elida St., Winnebago, Ill. The restaurant doubled as the city’s first bar in more than 100 years. When reflecting on her 20 years in business, Princer feels grateful. The menu is diverse, ranging from Italian dishes to barbecue ribs. 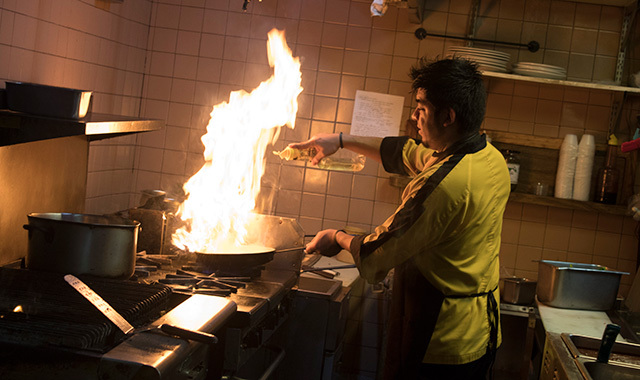 Head chef Anuar Ojeda oversees the day-to-day cooking, while Princer handles the catering. Together, their collaborative efforts result in creative new dishes. Both chefs rave about the winter pasta. A signature dish, winter pasta is one of two dishes that have been on the menu for all 20 years. Sautéed garlic, artichoke hearts, sun-dried tomatoes, prosciutto and shrimp rest on a bed of penne. She’s open to suggestions when it comes to menu additions. For example, “Bill’s Onion Rings” is named after a regular customer who once asked politely for onion rings. Princer thought it was a great idea. Princer believes her younger employees are the future of the restaurant and the broader industry. This entry was posted on Friday, August 17th, 2018 at 11:59 am	and is filed under Dining Guide. You can follow any responses to this entry through the RSS 2.0 feed. Both comments and pings are currently closed.